Less than 1% reactivity to vasopressin. Our Abpromise guarantee covers the use of ab2078 in the following tested applications. 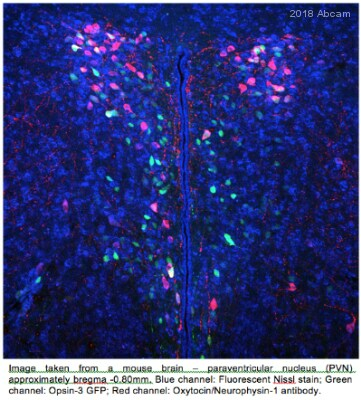 Immunohistochemistry (PFA perfusion fixed frozen sections) - Anti-Oxytocin-neurophysin 1 antibody (ab2078)Image from Ettrup KS et al, J Chem Neuroanat. 2010 May;39(3):151-65. Epub 2009 Dec 28, Fig 2, doi:10.1016/j.jchemneu.2009.12.004. Minipigs were deeply anesthetized with a combination of midazolam and ketamine, prior to transcardial perfusion with phosphate buffered 4% paraformaldehyde (pH 7.4). After perfusion, the brains were removed with special care taken to preserve the optic chiasm and the median eminence. Blocks of tissue containing the hypothalami were dissected, postfixed in the same fixative for 1 day and subsequently cryoprotected in 30% sucrose for 3–4 days, prior to freezing. 10 series of 40-mm thick coronal (6 animals), sagittal (1 animal), and horizontal (1 animal) cryostat sections were collected. Coronal sections for immunohistochemistry were maintained at -18°C as free-floating sections in a cryoprotectant poly-ethylene glycol solution for up to four weeks. ab2078 stained HepG2 (human liver hepatocellular carcinoma cell line) cells. The cells were 4% formaldehyde fixed (10 minutes) and then incubated in 1%BSA / 10% normal goat serum / 0.3M glycine in 0.1% PBS-Tween for 1 hour to permeabilize the cells and block non-specific protein-protein interactions. The cells were then incubated with the antibody ab2078 at 1/200 dilution overnight at +4°C. 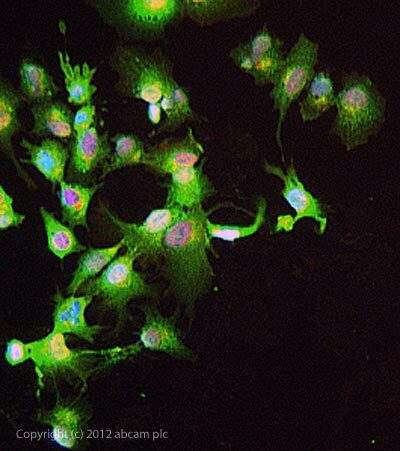 The secondary antibody (green) was DyLight® 488 goat anti- rabbit (ab96899) IgG (H+L) used at a 1/1000 dilution for 1 hour. Alexa Fluor® 594 WGA was used to label plasma membranes (red) at a 1/200 dilution for 1 hour. DAPI was used to stain the cell nuclei (blue) at a concentration of 1.43 µM. Publishing research using ab2078? Please let us know so that we can cite the reference in this datasheet. Dear ladies and gentleman, I am interestet in the anti-OT and anti-AVP antibodies from this paper: PLoS One. 2011;6(8):e23362. Epub 2011 Aug 17. Oxytocin and vasopressin involved in restraint water-immersion stress mediated by oxytocin receptor and vasopressin 1b receptor in rat brain. Zhao DQ, Ai HB. unfortunately in the refference list of all of your antibodies i couldn´t find this paper, although they had their antibodies from your company. can you please help me? Thank you for your inquiry. Unfortunately, we are unable to track down the particular antibodies the authors used when it is not specifically mentioned in the paper. 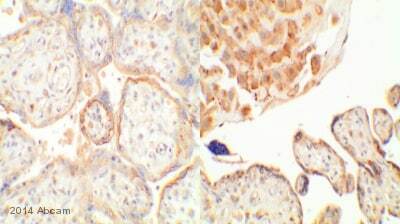 However, the following antibodies might have been used: ab39363: anti-Vasopressin (AVP), guaranteed to work in immunohistochemistry (PFA perfusion fixed frozen sections and frozen sections, IHC-FoFr, IHC-Fr) on rat. Click here (or use the following: https://www.abcam.com/index.html?datasheet=39363). ab2078: anti-Oxytocin, guaranteed to work in RIA and immunohistochemistry (PFA perfusion fixed frozen sections and paraffin-embedded sections, IHC-FoFr, IHC-P) on rat. Click here (or use the following: https://www.abcam.com/index.html?datasheet=2078). 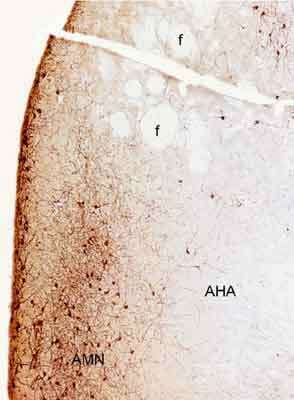 ab11143: anti-Oxytocin, guaranteed to work in immunohistochemistry (frozen sections, IHC-Fr) on rat. Click here (or use the following: https://www.abcam.com/index.html?datasheet=11143). ab78364: anti-Oxytocin, guaranteed to work in ELISA and immunohistochemistry (PFA perfusion fixed frozen sections and paraffin-embedded sections, IHC-FoFr, IHC-P) on rat. Click here (or use the following: https://www.abcam.com/index.html?datasheet=78364). We are happy to reassure you that all of our products are covered by our Abpromise, which guarantees that the product will work in the applications and species specified on the datasheet, or we will offer a replacement, credit, or refund within 6 months of purchase. If the product is to be used in an untested species or application, you may be eligible for our testing discount program if the antibody has not yet been purchased. Please contact our Scientific Support team by replying to this email prior to purchase for more information. I hope this information is helpful. Please do not hesitate to contact us again with any other questions. I am setting up an RIA to measure oxytocin in rabbit serum and thought your ab 2078 would work. On your website it is listed as having been tested for RIA, do you have a protocol available? Any information regarding this application of ab2078 would be appreciated. Thank you for your enquiry. I am sorry but we do not have an online RIA protocol. However, I would like to recommmend the following resources: http://www.ncbi.nlm.nih.gov/entrez/query.fcgi?cmd=Retrieve&db=PubMed&list_uids=716433&dopt=Abstract http://www.phoenixpeptide.com/qcdata/RIK/protocol10-1280_p.pdf http://faculty.washington.edu/jwingfie/protocols.html I hope this information helps, please do not hesitate to contact us if you need any more advice or information. Thank you for your quick answer. I know that sometimes antibodies against vasopressin and oxytocin are using for immunostaining of vasotocin and isotocin. I would like to ask you if it's possible to use your antibodies ab8745 (anti-vasopressin) or ab2078 (anti- oxytocin) for vasotocin or isotocin staining? Could you inform me about cross-reaction of ab8745 and ab2078 with vasotocin or isotocin, please.I will be very grateful for your help.